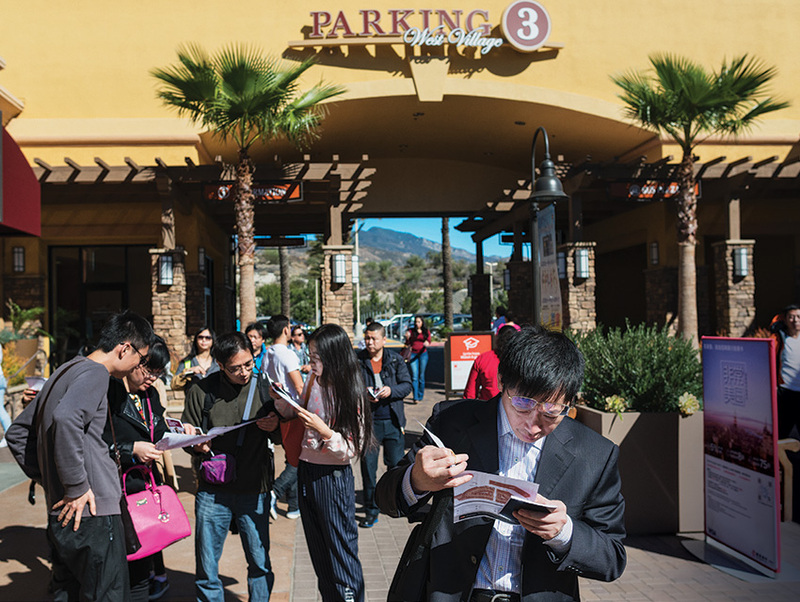 It was just after 12 at the Desert Hills Premium Outlets, and Ms. Cao had already amassed a substantial haul: Arrayed around her like hunting trophies were oversize shopping bags loaded with shoes from Hugo Boss, shirts from Giorgio Armani, and three identical $225 purses from Coach. But Ms. Cao was in a foul mood. She had been dropped off at the mall, located beside a barren stretch of the 10 freeway a few miles west of Palm Springs, along with 20 others in her tour group from Tianjin, China, and given a mere two-and-a-half hours to complete her shopping. Though Ms. Cao (she declined to give her first name) had scoured the mall’s Chinese-language Web site the night before to map out the stores she wanted to hit, time was running low, and she wasn’t close to being finished. Among the items she still needed: a large Samsonite suitcase to hold her loot. Desert Hills is among the most anticipated stops on the circuit for Chinese tour groups, ranking just below Universal Studios. By 2 p.m. 20 buses carrying 440 Chinese tourists are parked at the mall, according to the property’s management. That doesn’t include the dozens of minivans that have disgorged smaller groups. Many plan to spend seven hours or more here. What makes Desert Hills appealing to this crowd is that brands such as Versace, Yves Saint Laurent, Prada, and Burberry are nestled so tightly that shoppers can bounce between them like credit card-wielding pinballs. 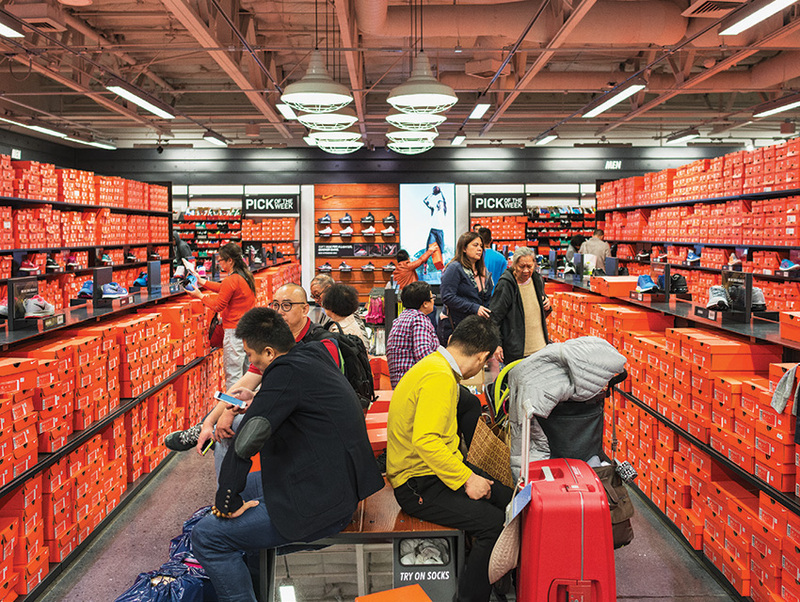 Inside the Coach store, three Mandarin-speaking salespeople do laps between the storeroom and the showroom to fetch merchandise for shoppers, who often buy more than one of the same item. As she waits in a checkout line that extends to the back of the store, Landi Luan struggles to balance ten handbags, all exactly alike and retailing for $195 each, that she will distribute to friends in China. Shoppers say the luxury goods prices are 30 to 50 percent cheaper than those back home, even for the stuff that is assembled there, owing to China’s coterie of sky-high taxes and tariffs. In Southern California, a region still dusting itself off from the financial crisis, few prospects loom as brightly for the economy as the rising tide of Chinese visitors. The Los Angeles Tourism and Convention Board expects that the final tally of Chinese arrivals in 2015 will be roughly 750,000, more than double what it was five years ago. While here, they spend in excess of $200 a day, but that’s just an average. In 2014, Chinese tourists accounted for 60 percent of spending on Rodeo Drive. The heady numbers have sent tourism bureaus and retailers scrambling to win a spot on the itineraries of major tour operators and high rollers. The Desert Hills parent company, Simon Property Group, routinely dispatches its marketing staff to China to meet with tourism outlets and retains a marketing agency in Shanghai. The L.A. tourism board maintains an office in both Beijing and Shanghai and recently opened one in Guangzhou. It has launched something called the “China Ready” program, a sort of mini boot camp that helps hotels and attractions develop media materials in Chinese, makes sure they accept Chinese credit cards, and preps them to better anticipate the needs and wants of Chinese guests. Yet for years he felt the hotel could be doing more. Simply put, it was booking more rooms but not collecting revenue from extras, like massages, meals, or poolside cabanas. The staff couldn’t fathom why Chinese guests would decline an upgrade on a $500 room and then go on a $6,000 shopping spree. Velasquez’s solution was to understand his guests better, essentially rolling out a red carpet tailored to Chinese travelers. He translated the hotel’s Web site and app into Chinese, but changes began to materialize only when he hired a concierge dedicated to visitors from the mainland. Jing Wan, a woman in her early twenties whose short black hair frames her round face, grew up in Chengdu, China, but went to high school in Colorado. She connects with guests by phone or via digital channels like WeChat—the popular Chinese social messaging app—before they board a plane and begins mapping out their trip. “The number one question they ask is about buying real estate,” she says. Number two is about shopping. A favorite amenity: use of the hotel’s chauffeured Rolls-Royce Phantom for trips to Rodeo Drive. Wan remembers a guest who spent a week at the hotel for the sole purpose of landing a limited-edition Birkin handbag from Hermès. The bag was a no-show, so the woman plans to return for a full month to wait for it. Not understanding the cultural preferences of your customer is certainly a hazard when you’re trying to attract tourist dollars. But there’s also misunderstanding about the tourists themselves. Fully independent travelers, or FITs in industry jargon, are the most lucrative because they set their own agendas. A staple of the Four Seasons, they include China’s growing ranks of billionaire entrepreneurs, high-level executives from its largest firms, and government officials (beneficiaries of the country’s notoriously corrupt political system). Tour groups, which account for 70 percent of the market, are more complicated. Those like Ms. Cao’s fall in the middle. Travelers in this group may have already been abroad and carry high expectations about being able to hit fancy stores and marquee attractions, but they aren’t quite confident enough to venture out on their own. The bulk of Chinese travelers, though, have scrimped and saved enough to be able to afford their first excursion overseas. Their experience can be more of a long march than an actual vacation, with the wrong kinds of surprises along the way. Sonny Shang immigrated to the United States from Xi’an, China, in the 1980s and works as a tour guide here. He complains that many of the packaged tours advertise one price for the trip in China but then tack on extras, like meals and amusement park entrance fees, once visitors arrive in the States. The Guangzhou-based China Comfort Travel Agency offers an eight-day West Coast trip for about $1,700, which covers airfare, hotels, and little else. It starts with a quick tour of Hollywood (Dolby Theatre, Walk of Fame) followed by a bus ride to Las Vegas, with brief stops at the Grand Canyon and Hoover Dam, before returning for a day at Universal Studios. The next day: Desert Hills Premium Outlets. On the final day it’s a drive to an aircraft carrier museum in San Diego, then back to China. During the trek, these travelers are frequent targets of scams, sometimes perpetrated by their own tour operator, say people in the business. Tour companies in China offer rock-bottom prices and eke out a small profit by stuffing visitors in hotels as far away as Chino Hills or Rancho Cucamonga, where they cut deals for room rates for as little as $55 a night. “The last thing we want is our visitors staying outside the city, thinking they are in L.A. and spending the whole day in traffic,” says Smits of the L.A. tourism board. To protect tourists from being surprised with extra charges, the Chinese government has issued regulations requiring tour groups to publish only what was included in their package deals. But that doesn’t address the inflated costs or another practice Shang says is rampant: busing tour groups to a gift shop where choice is limited, prices are high, and the products are of dubious origin. “I know all the games they play,” he says. In front of a crumbling two-story stucco mall in Rosemead, tour buses pull up every few minutes to unload weary Chinese travelers. A tour guide hustles each group into Royal Gifts Co., whose windows are caked with grime. The shop doesn’t open until around 5 p.m., when the buses begin to rumble in, and its clientele appears to be exclusively Chinese. Inside, signs are in Chinese and prices are listed in renminbi, the Chinese currency. Gold watches, digital cameras, Swiss Army knives, and ginseng tablets line the aisles. One traveler in his early forties from Hangzhou lingers outside, choosing to smoke instead of shop. “We didn’t want to come here,” he says impatiently. “We were taken here. We’re being rushed from place to place.” A few moments later his tour guide ushers the shoppers into the Best One Restaurant next door, which caters to tour groups with bargain meals that cost about $7 a person. A Chinese talent show blares from a wall-mounted television as tourists hurriedly finish their meals to make room for new arrivals. Shang says that gift shops and restaurants like these (several dot the area) pay guides for bringing tours, an accusation echoed by others in the industry. “Sure, there might be a lot of money coming into California,” he says, “but a lot of it goes right back to China.” However, Edward Zhao, the proprietor of Best One, maintains that while tour guides do contact him from China to bring in their groups, kickbacks are not part of the deal. Lucy Cai, the manager of the gift shop, insists she doesn’t pay kickbacks, either. Chinese shoppers are a savvy bunch, she says, and know the going rate for her products, making it difficult for her to mark goods up. Any local spending is better than none, but the budget-minded groups simply don’t share the wealth the way FITs do. That extends to local employment, since the tour guides are often from the mainland. “They don’t have a work permit; they’re just coming over here on a tourist visa,” says Jamie Lee, who worked in China for the L.A. tourism board. That equates to “stealing jobs” from Californians, she says. So Lee helped draft a state assembly bill to clamp down on this practice and establish minimum standards; too often guides from the mainland don’t know much about the region. The bill, which has yet to come up for a vote, isn’t the only way to tap into Chinese tourism. But it would help. A decent guide might spark curiosity about the area, encouraging people to hop off the bus to experience more of what the region has to offer. Rumor has it the local food is pretty good. Additional reporting by Corrina -Shuang Liu.